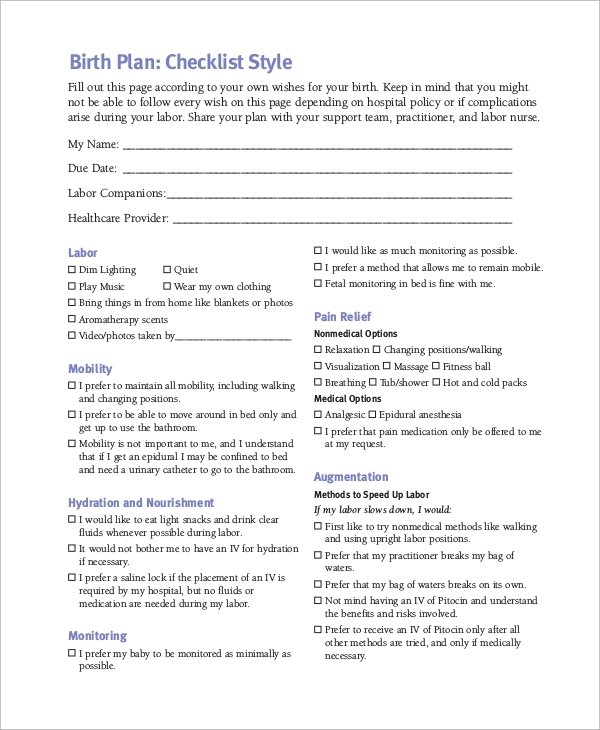 A birth plan is a statement or a document that includes the concerned parents’ consents and dissents regarding several practices and steps to be taken at the time of labor. 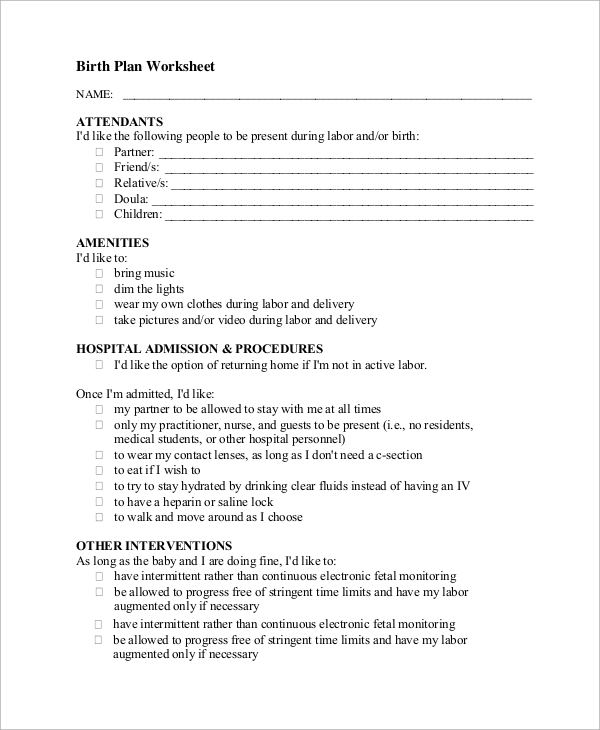 A Birth Plan helps the medical team of the concerned patient to understand the needs and preferences of the couple which is discussed and planned prior to the labor, to avoid additional chaos rising from any misunderstanding between the medical teams and the expectant parents in the labor room. 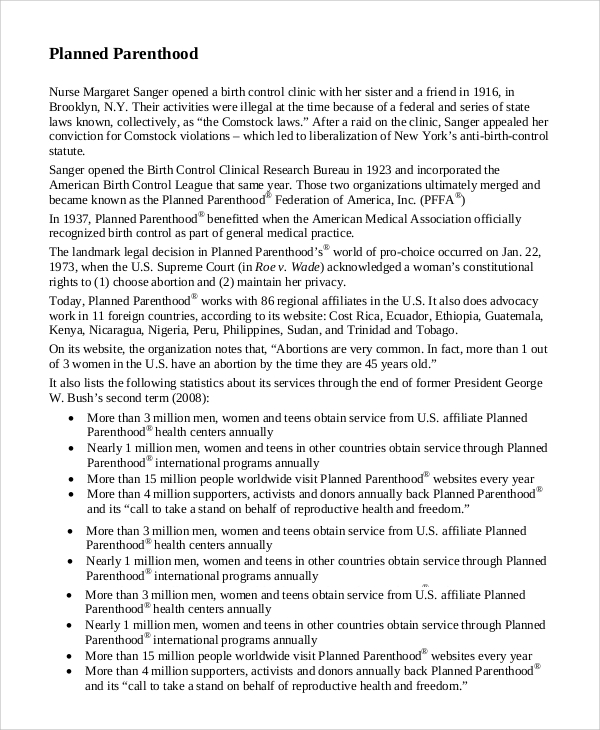 Planned Parenthood methods of birth control were initiated by Nurse Margaret Sanger in 1923. Planned Parenthood birth control measures have benefitted a large number of men and women in the USA. Natural Birth plan sample presents a statement filled up by the parents for ensuring a safe delivery and good health of the baby and the mother pre and post delivery. You can also see Action Plan Samples. 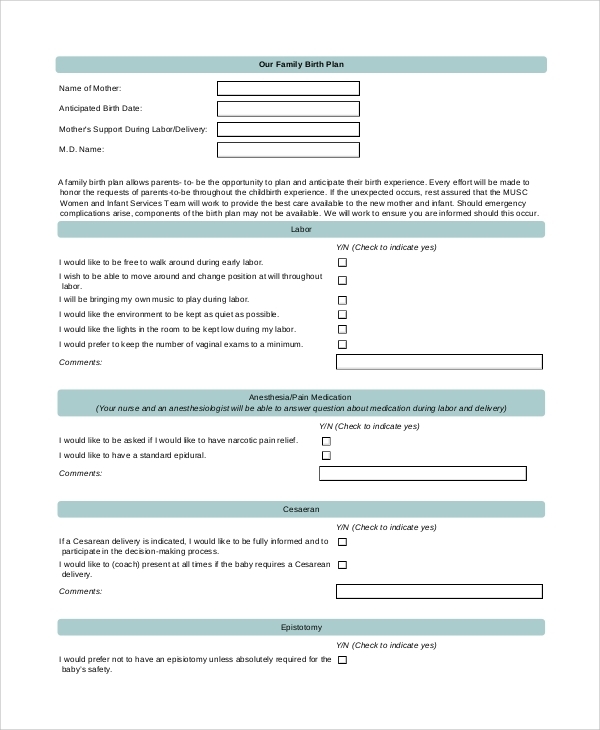 Family Birth Plan is an official form filled out by the expectant parents to help the medical team take necessary steps and ensure a safe delivery of the baby. 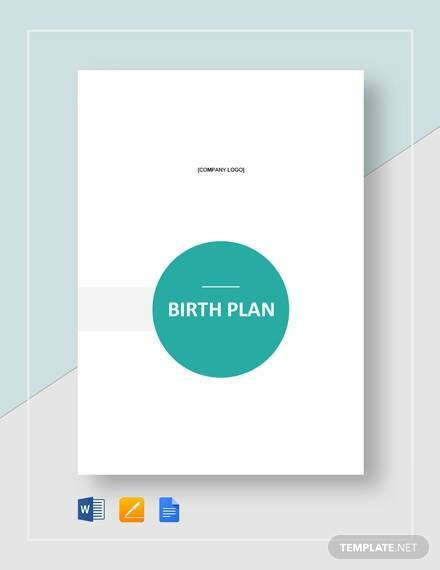 A sample birth plan which includes different sections that need to be discussed between the concerned medical team and the expectant parents helps prepare both the groups for the delivery date and thus ensures minimum additive chaos in the labor room. You can also see Care Plan Samples. A sample birth plan includes the preference of enema during any phase of labor, the preference of the injection of any pain killer or anesthetic drugs in the events of extreme pain, the preference of mode of delivery that is caesarean or normal and other post delivery measures. 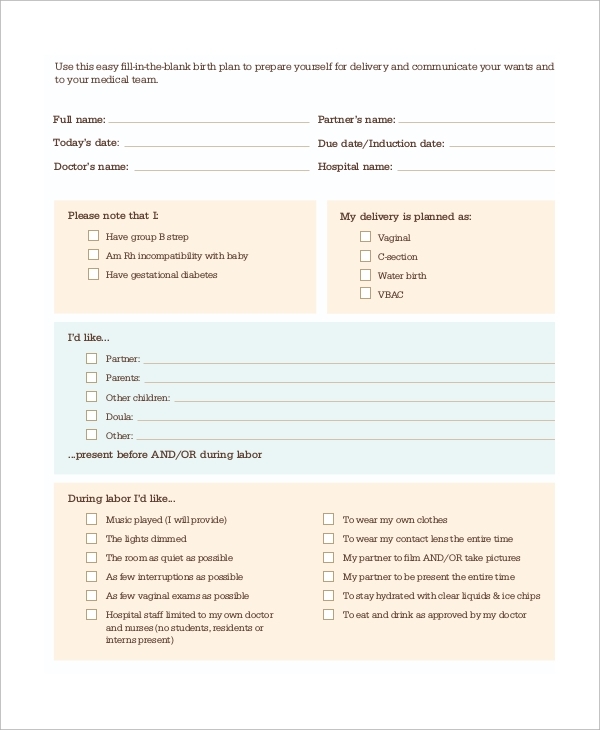 A sample birth plan might differ in the case of emergency. 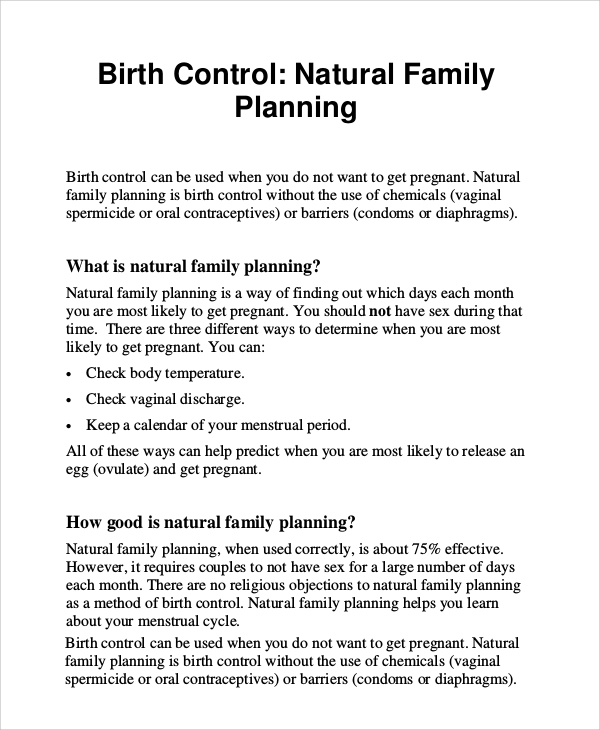 Natural Birth Control sample defines an approach of birth control which doesn’t involve the chemical or physical barriers of birth control. This sample birth control requires discipline of both the partners. 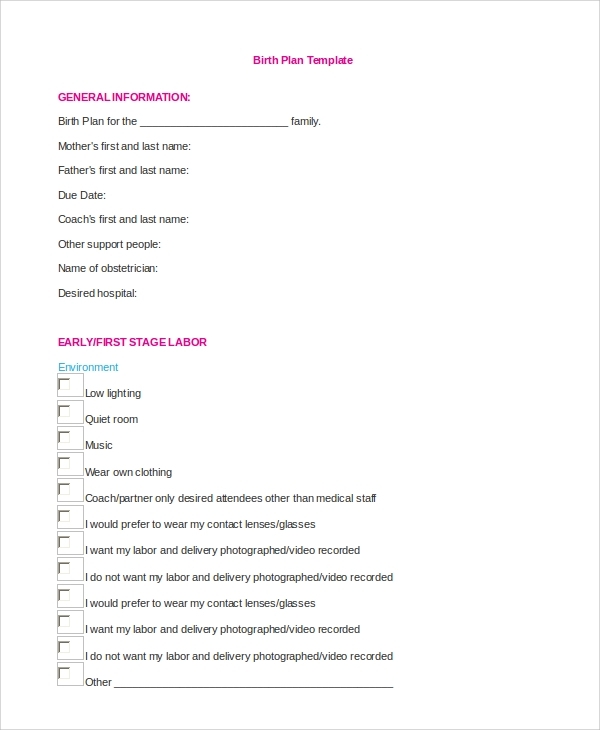 Labor Birth Plan sample helps the expectant parents understand the sections which need to be discussed with their doctor and associated medical team, months ahead of the expectant delivery date. A sample birth Plan Sample is required by medical teams involved in delivery measures and expectant parents who wish to acquaint themselves with the delivery date concerns and stay prepared for the concerns. The sample birth plan helps expectant parents to discuss preferences of labor management, delivery procedure, and medication preference as well as post-delivery baby care which includes breastfeeding preferences and also issues as delicate as the measures to be taken in case of an unhealthy baby or a premature baby birth. 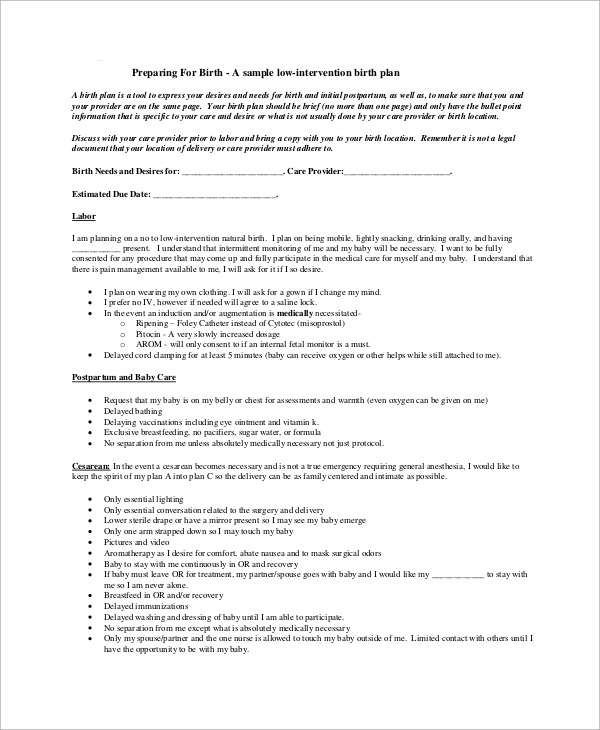 A Birth Plan Example helps expectant parents to be prepared for the delivery prior to the actual date. These situations need a mature discussion by the expectant parents and the medical team. The sample birth plan helps the medical team to define the exact points of such discussion with the expectant parents.